People used to search; how to solve isdone.dll error while installing games? How to fix Isdone.dll/Unarc.dll returned an error code? How to remove ISDone.dll & unarc.dll file error in PC game? 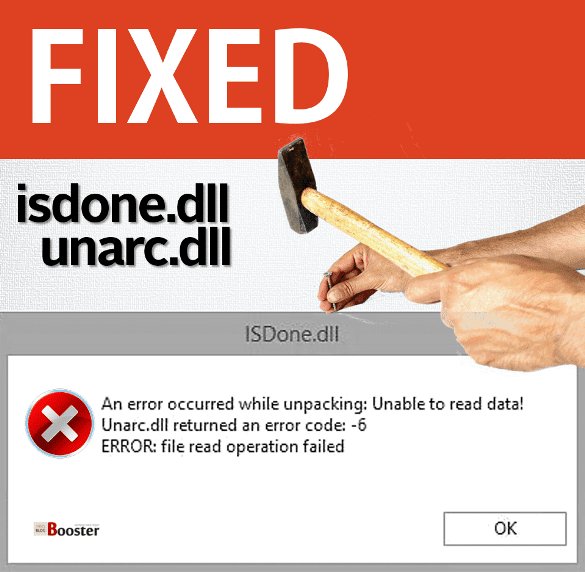 Getting rid of isdone.dll error unarc.dll error-7? Fixing unarc.dll error code: -12 check sum error? Solved the unarc.dll returned an error code 14? What’s QoS? How To Boost & Increase The Internet Speed by QoS | Make Router Faster? Remove archive header is corrupted unarc.dll error code 14? Some might faced isdone.dll/unarc.dll decompression error gta 4 installing game like Mafia, Call Of Duty 2019 and all. Typically such errors occurred when people tend to install "downloaded" games/applications etc. on their own machines "directly." These special DLL files are handled by your PC while playing PC games (usually high-end/high-graphics games), the file used to provide information to the CPU & GPU while playing that game. Usually, such errors occurred for video game and any other software/application which needed heavy graphics/animations. That is why the "ISDone.dll is missing" error message often arises during the installation of computer games gets failed. However, there is some role of DLL file which stops them from making these moves. The "Unarc.dll" and/or "Isdone.dll' file errors are very common in nature for Windows 7/8/10 machine users. In most of the cases, these DLL files have been deleted, shifted, damaged by malicious software installed on your machines or sometimes Windows registry changes. The "ISDone.dll" & "Unarc.dll" are the files that, like all the other "dll" files, situated at the System32 folder on 32-bit computer systems whereas in the SysWOW64 folder for 64 bit systems. Here I not only tell you to download isdone.dll or unarc.dll files but also you will get to fix dll missing errors on your computer system. Check system requirements to be required for the application. Check whether there are any updates/upgrades made in your software/hardware. Have you re-start/re-boot the machine before trying this. Is your 3rd party antivirus program is installed on your machine? Understand the step at which this error occurs. Once all the above is done, we now move forward to look into a couple of methods to resolve this error. Method 1: Run Windows memory diagnostic tool. Double click on 'Windows Memory Diagnostic'. It will prompt to RESTART your machine now or later; but requesting to save any unsaved data/files. Once your machine is restarted, it will display 'Windows Memory Diagnostic Tool' on a blue screen with some progression. Try one more time and check whether the issue is being resolved after the machine booted. Method 2: Performing a clean boot. Type 'msconfig' and hit enter. The 'System Configuration' window will be pop-up. Tick the checkbox named as 'Hide all Microsoft services' displayed at the bottom of the list. No Click 'Disable All' button displayed at the right side. Once all the above is done, navigate to 'Startup' tab. Click on 'Open Task Manager' option. Right-click on every item displayed under 'Startup' tab and select 'Disabled' option. It will prompt to restart the machine. Once the machine is booted successfully, try one more time and check whether the issue is being resolved. Method 3: Disk clean up. Type 'Disk Cleanup' and hit ENTER. 'Disk Cleanup' pop-up window will be opened with some progression going on. Once progress gets completed, it will list down files to be deleted from various areas like; Recycle Bin, Temporary Internet files, etc. Scroll down and select 'Temporary Windows Installation files' from the list. And click on 'OK' button. It will prompt to delete the files permanently, click on 'Delete Files' button. Once the cleanup is completed, try one more time and check whether the issue is being resolved. Sometimes, all the unwanted windows installation files won't be deleted. Hence, to do so, go to command prompt. Type or paste below commands and hit enter. Once all the above is done, try one more time and check whether the issue is being resolved. Method 4: User compatibility mode. Right click on the executable file/application. Select checkbox named; 'Run this program in compatibility mode for' option. Select 'Windows 7' option from listed items. Now select checkbox named; 'Run this program as an administrator' at the bottom. Click on 'Apply' followed by 'OK' button and run the executable file now. Method 5: Run Deployment Image Servicing and Management (DISM) tool. Type or paste below command and hit enter. This process may take several minutes or hours, so please have patience. Once this process gets 100% complete, restart the machine. Now check whether the issue is being resolved. Method 6: Improve performance by optimizing the hard drive. 6.1: Improve performance by Repairing bad sectors in hard drive. Enter below command and hit Enter. It will prompt you to accept whether this process will be run after machine restart with 'Y' or 'N' options. Enter 'Y' and hit enter. The system will show a message saying "Scanning and Repairing drive (C:): x% completed." All the system to complete the process. 6.2: Improve performance by Defragmenting the hard drive. Click 'Start' and enter 'Defragment' option. Disk Defragmenter window will be opened. List of drives will be displayed. Select 'C' drive and click on 'Analyze' button. Allow the system to complete the analysis process (status can be viewed under 'Current status' column). Once this analysis process gets completed, check % fragmented. If % is more than 10%, select the drive and click on 'Optimize' button. This process may take some minutes or hours, so please have patience. Method 7: Download and paste new DLL files under System 32 folder. Download the required *.dll files from internet. Make sure that, you download the files same as that of your system type (32-bit/64-bit). Save these files on your machine. Copy say "Unarc.dll" and/or "Isdone.dll'. Go to 'My Computer' and access 'C' drive. Navigate to Windows >> System 32 folder. Search for above *.dll files under 'System 32' folder. Rename them and append 'BACKUP' text to those files (e.g. "unarc_BACKUP.dll"). Paste the newly downloaded files under 'Windows >> System 32' folder. Now paste the files under 'Windows >> SysWOW64' folder if your machine is 64-bit. Once the machine gets restarted, check whether the issue is being resolved. Method 8: Check all the installation files. In most the cases, if above methods are not working for your PC, you need to RECHECK all the files again. In the torrent application, there is an option to recheck all the files. Go to torrent app >> select the file >> right click >> choose 'Force Re-Check' >> wait to finish. There must be some files missing and it will get downloaded again to your PC. Now try installing that application and you'll see the issue is solved. If you know any other better way, then don't forget to share it here. Also don't forget to LIKE, SHARE and FOLLOW us on social media.